Permiline is generally used for transporting corrosive oil or water. However, where the water to be handled is known to have an extremely low pH (as in the case of CO2 injection or production) or should future requirements call for the flexibility of being able to acidize a potential scale build up, then FLOUROLINE should be considered. Regardless of which of the products is selected, the customer is assured of a long-lived and highly versatile interior coating. Protective Mechanism: The protective mechanism of cement lining stems from passivation at the steel-cement contact area due to increased pH, and the long-term reaction between cement and pozzolanic materials which results in self-healing of small cracks in the lining. Laying: Pipelines are customarily deflected to follow terrain contours. The “rule of thumb” for cement lined pipe is: no damage will occur to the lining provided the yield point of the steel is not exceeded. For design purposes see the following chart and table. Should abrupt bends be anticipated, then cement lined fittings must be used. Because the cement lining has a coefficient of thermal expansion virtually identical with the steel tube, no consideration need be given to temperature changes. 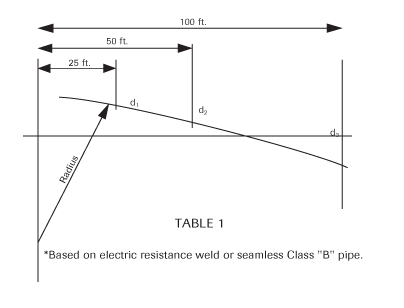 Joints may be coupled by (1) welding – using a special gasket (2) the conventional T&C joint with PERMITEK joint compound (3) or the seal grooved type coupling. There are other trademarked coupling systems available. Fields cuts can be made with either saws, or cutting torches; however, rough lining ends should be repaired with our easily applied patching compound. Handling: Care should be taken to prevent either denting or permanent distortion of the steel tube. Such damage can result from throwing lined pipe from trucks, allowing it to strike a hard object, or exceeding the legal overhang during transport. Hooks or other objects should not be inserted into the pipe ends. 2" 130 ft. 2' 4" 11' 6" 46' 11"
3" 190 ft. 2' 10" 6' 8" 28' 5"
4" 250 ft. 1' 2" 5' 0" 20' 11"
6" 360 ft. 0' 11" 3' 6" 14' 2"
8" 470 ft. 0' 8" 2' 8" 10' 10"
10" 580 ft. 0' 6" 2' 1" 8' 8"
12" 690 ft. 0' 6" 1' 10" 7' 4"
14" 750 ft. 0' 5" 1' 8" 6' 8"
16" 860 ft. 0' 4" 1' 6" 5' 10"
18" 970 ft. 0' 3" 1' 4" 5' 2"
20" 1080 ft. 0' 2" 1' 2" 4' 7"
24" 1290 ft. 0' 1" 1' 0" 3' 11"